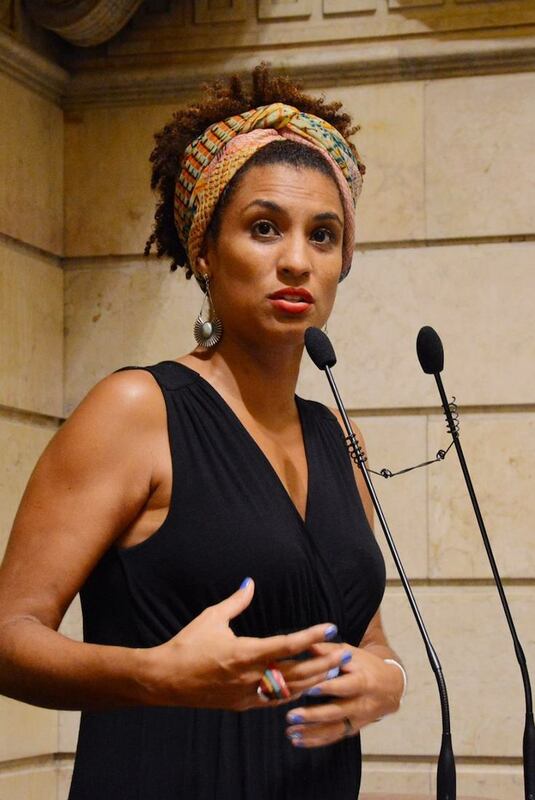 I wanted to write about Marielle Franco for last Monday’s post, but it was so deeply upsetting to read about her so soon after her death that I couldn’t get it done. 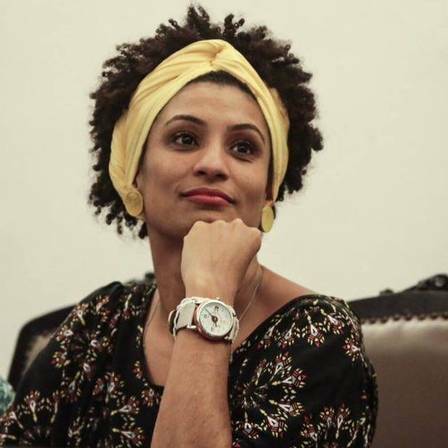 On Tuesday, March 14, Brazilian activist and politician Marielle Franco was assassinated at the age of 38. There are so many layers of tragedy with this story as Marielle was a truly extraordinary individual, a visionary leader, and a dedicated protector of the vulnerable and underrepresented. It is difficult to imagine that someone who can exude so much charisma and energy in a still photo could be gone. Marielle was born and raised in the slums of northern Rio de Janeiro, and began working at the age of 11. She gave birth to her daughter, Luyara Santos, in 1990 when she was 19. She raised her without the help of the child’s father by working as a pre-school teacher making minimum wage. When a friend was killed by a stray bullet in 2000, she began working in human rights activism while she completed her pre-university studies. In 2002 she enrolled at Pontifical Catholic University of Rio de Janeiro on a scholarship where she earned a degree in social sciences while she continued working and raising her daughter. She earned a master’s degree in public administration from Fluminense Federal University and wrote her thesis on the law enforcement program aimed at ending gang control in the city’s favelas (slums). 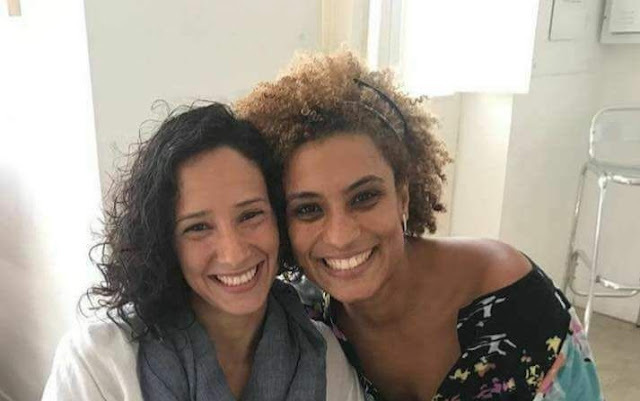 Marielle began work in 2007 working for state representative Marcelo Freixo where she coordinated the legislature’s Committee for the Defense of Human Rights and Citizenship. She worked for the Brazil Foundation and the Maré Center for Solidarity Studies and Action, both of which were civil society organizations. In 2016, she ran for city council. As a single mother and a black woman from the slums, she ran on a platform for the defense and representation of people living in the favelas and poor black women. Out of 1,500 people who were running for city council, she received the fifth highest number of votes, and was one of 51 who were elected to serve. As a city council member, she chaired the Women’s Defense Commission and formed a committee to monitor federal intervention in her city. She fought against gender violence, and was an active supporter of reproductive rights and the rights of the people living in the favelas. She frequently and publicly denounced police brutality which was a regular reality for many of the people living in the slums. As an individual who identified as part of the LGBT community, she proposed a bill to establish a day of lesbian visibility, but the bill was defeated 19-17 in August 2017. In 2017, Marielle and her partner of 12 years, Mônica Benício, moved with her daughter to the neighborhood of Tijuaca. It breaks my heart looking at those two happy faces. On Mach 13, Marielle wrote against police violence on her Twitter. 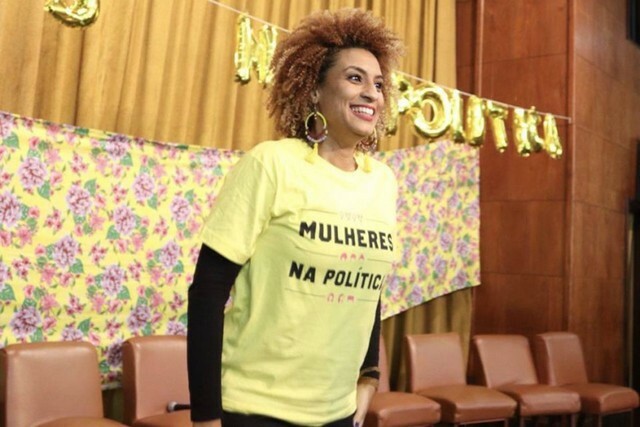 On March 14, she attended a discussion “Young Black Women Moving [Power] Structures.” Less than two hours later, she along with her driver, Anderson Pedro Gomes, were murdered by two men in another car. Nine shots were fired, four of which hit Marielle in the head and neck. Her press officer who was in the seat next to her survived with injuries. Marcelo Freixo arrived at the scene shortly after the news broke, and stated that it appeared to be an execution. The Rio de Janeiro police reinforced this statement in their study of the direction and concentration of the bullets. The bullets were found to have been purchased by the Brazilian federal police in 2006. The Minister of Public Security stated that the bullets were stolen, but the ministry has subsequently retracted the statement after a denial was issued by another organization. 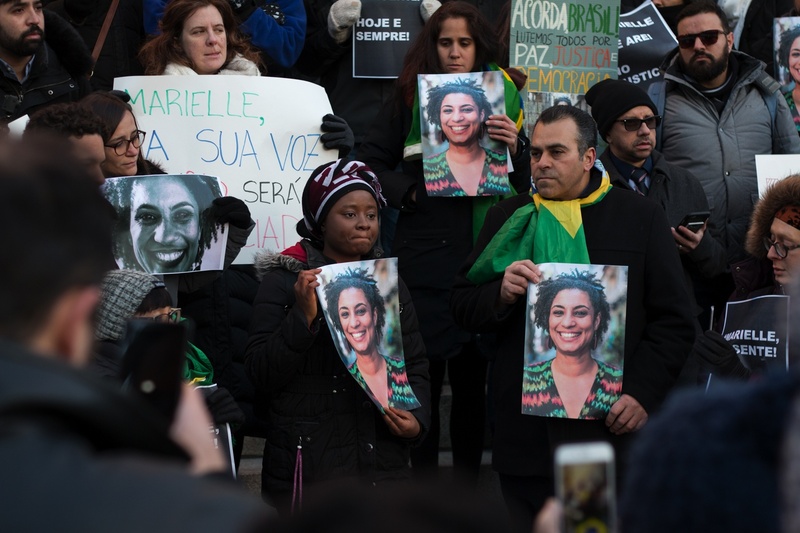 It is widely believe that Marielle’s death is connected to her public stance against police violence and federal interference. 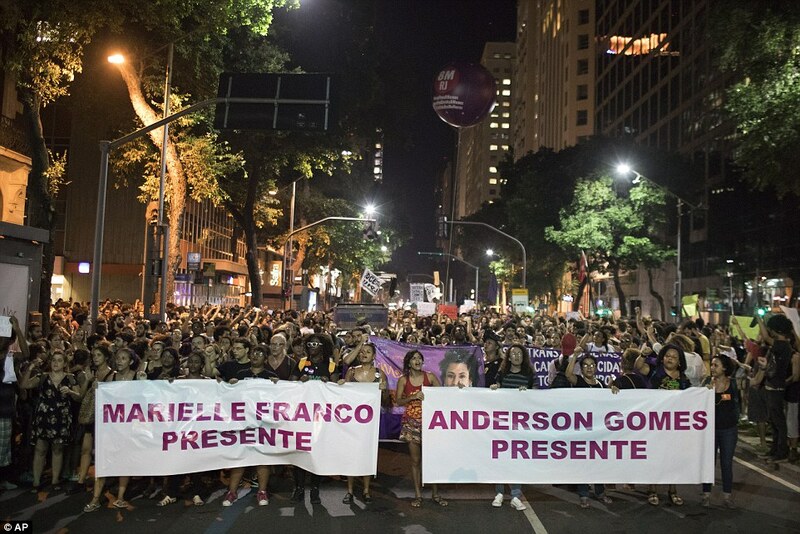 Marielle’s death was tragic news for many Brazilians, and thousands took to the streets in coordinated protests across Brazil. As her close friend Glenn Greenwald shared, “Her relentless and brave activism against the most lawless police battalions, her opposition to military intervention, and, most threateningly of all, her growing power as a black, gay woman from the favela seeking not to join Brazil’s power structure, but to subvert it.” She fought for the rights and protection of the most vulnerable people in her country. It is tragic not only because such a young life was taken, but also because of what she could have contributed to make her city and country a better place to live for everyone. I hope that her legacy continues to inspire the people of Brazil to fight against corruption and to advocate for the underrepresented.